I don’t like lying to people who I know will be dead in minutes because it doesn’t seem fair. It’s hypnotic in the back of a rescue when the fight for life is lost and resignation appears in the victims’ faces. I tell them to hang on, to keep fighting, but they know the truth. I can see it in their eyes. I am the last thing they see before leaving this earth forever. Many of us try to peel back the cover on the city now and then — look into those seldom-seen places where people do crazy, mean, loving, funny, desperate things. But Michael Morse does it again and again and again. There are times when he might want a break from it, maybe a whole hour to put his head back and not deal with all that injury and pain and assorted madness. And he is off again, into the rescue wagon and off to another human pileup in Providence — and another chance to see the city with a writer’s eyes. Morse has been an emergency medical technician (EMT) and firefighter in Providence for 16 years. He is one of those people, like most who work at firehouses, who are hooked on the job. Despite the falling-down fatigue that comes with call after call, he would have it no other way. He has been a writer for a lot of years too. It is tough to say just when that part of him kicked in. He remembers his days at Bishop Hendricken High School, where he did not light up the honor roll. But he got that B in English once. There were some early indications that he could do things with the language. And he has. He’s written a book, and it’s so damn good that I can’t stand this guy. I mean, just where does he get off climbing out of a rescue wagon and writing with this kind of feeling and pace and vivid recollection? It’s called Rescuing Providence, and it covers one 34-hour shift around Easter weekend of 2004. “I was driving to work one day and just decided to write a book about this,” he told me. He started taking notes. He would finish a call and write down the most memorable details. When he got home, he typed up the notes. Sometimes, he says, he would remember something a couple of days later and think, “that was interesting.” And he would write it down. He has been published before, in Rhode Island Monthly and on the editorial pages of The Providence Journal. He wrote a wonderful piece about the challenges EMTs face when removing drunks from city streets. When he finished his book, he says, he sat back and waited for the publishers to knock down his door. Instead, they sent rejection slips. Morse’s wife, Cheryl, says there really were enough rejection slips to paper a good part of a room in their house in Warwick. Then came the day when Morse was mowing the lawn and Cheryl came out to tell him that the call had come from his agent: A publisher had picked up Rescuing Providence. It will be officially released in a few weeks by Paladin Press. Morse isn’t sure how much promotion he’ll do. This is all very new to him. But buy this book, and not just because it is drawn from the streets of Providence. Buy it because it gives us all the chance to go to the places and meet the people that we too quickly pass by. Buy it for the opportunity to know the incredible things that happen when a stranger from the Fire Department shows up to sew people up and calm people down and sometimes deal with the mean and dangerous side of the city. What makes Morse’s book such a pleasure to read is not just the accounts of the rescue calls but the way he blends in the memories of the way the city used to be and his life with Cheryl and their two daughters and the special connection that develops with the people who work alongside him. He tells of going food shopping with his grandmother on Federal Hill. And he tells of dealing with the changes that had to be made when Cheryl discovered she had multiple sclerosis. Then, late in the book, is the reminder that on any call, an EMT can face the worst kind of human tragedy. Morse was working out of the Branch Avenue station when a fire call came in. A mother had left two babies with a babysitter and gone out for a drink. The babysitter left the babies because she wanted to have some fun and assumed the babies were asleep. Both babies were burned to death. Morse recalls he was in the station the next day, blaming himself for the disaster and saying, “I’ll never wish for another fire.” Chief Ronny Moura, whom he describes as a “grizzled veteran firefighter and all-around tough guy,” overheard him. And so it goes for those who do the work that EMTs and firefighters do. No one on the outside can possibly understand. But we can read Rescuing Providence and get a rich and varied taste of it. A reader of this truly fine book will surely do that. This book is soft cover measuring 5 &frac12;” x 8 &frac12;” and has 155 pages. The author is an officer on a rescue unit of the Providence, Rhode Island Fire Department. There are five rescue units in the PFD and all are type 1 ambulances. The crews are firefighter/EMT’s . They have advanced classifications which authorizes them to do certain paramedic duties. Providence is the capital of the state and like a large city, has a diversification of its population and its neighborhoods. As you can expect, the rescue units are very busy and this book takes you through a certain 34 hour period. The work schedules are two 10 hour days followed by two 14 hour nights. This particular period encompasses a 14 hour overtime tour between the author’s two regular day tours. The overtime tour is served from a different fire station than the author is normally assigned. There are three parts to the book, each is of one of the tours. The time of dispatch is given for each call along with the type reported. Now, theoretically, you could read this book through in one sitting. It wouldn’t take 34 hours to do but when you were finished, you’d probably think it did! The book is nearly non-stop running, or so it seems. Naturally EMS runs take up most of it with a vast array of medical problems, but let’s face it, EMS will always be the majority of calls even in a busy Fire Department, simply because there are more people out there than buildings or other things to burn. Many of those people are also repeat customers. Some FD’s only answer life threatening calls but this is when there is another primary EMS source. There’s no warming up in the bull pen as the book unfolds…no bloody nose or someone whose been vomiting all day. We go right to Providence College at 0230 hrs., for a student who fell 80 feet from a dormitory roof while trying to check out the scenery with friends but lost his footing apparently on the way up from an open window. Now he’s going to be lucky if he winds up good for more than just “parts!” And this is just the prologue! Part 1 opens with the start of the day at home, a description of Providence by population and Fire Department structure, the work schedule and some thoughts about what was on his mind from past calls. After probably breakfast and the three S’s, he is on his way to work explaining the unfolding of the Providence skyline as it appears on the horizon. He gets to work a little early and is already out the door on a head injury call followed an hour and a half or so later by an overdose and so the beat goes on. The descriptions of the calls are in detail from the dialog between the crew while en route, to assessment of the patient, to the emergency department of the hospital. He tells his story with no holds barred. Firefighters are human and humans are not perfect. From time to time the job does get to him as it would anyone, particularly when responding to medical calls as well as accidents and fires they all take a toll on the mental and physical condition of the responder. Anyone who worked medical calls will know that you get to know some patients very well because you see them so much. It stands to reason how one would get a little irritated running the same viscous cycle with some of these people, and although they are indiscriminately taken care of each time, this is what can contribute to burn out. Add to this patients and/or their relatives, accomplices, etc. who either get impatient with the routine of patient assessment or demand that responders just get the patient to the hospital, then you will realize the abuse that crews can be exposed to. Some of the calls are of a serious nature such as fractures, amputation, laceration, shooting, suicidal, motor vehicle accidents, congestive heart failure and allergic reaction. There are also some working fires with rescues and tragic consequences. The imagery puts you right there with the guys as they do their job. Firehouse routine, meals, recipes and horseplay are also written about in this book. As I’ve said many times, sometimes we laugh to keep from crying. I believe this book is valuable for those who want to know what the job is like, for civilians, which will help them appreciate how these public servants give their all for others and for emergency room staff who only see them when they come in and when they leave. It kind of fills the in between time and the experiences they went through to bring them their patient! Finally it is for those who just like to read these type books either to reminisce similar experiences from their past or to reinforce our respect for firefighters! Years ago, FF Dennis Smith of FDNY Engine 82 brought much, exposure of firefighters to the public which gained respect and recognition of them when there was a shortage of it. Add to that the same for the firefighters who add EMS to their job description and tell their stories in books like these. When Michael Morse was a boy in the 1970s, the TV show Emergency was his favorite, and when playing war he always wanted to be the medic. So when the Providence firefighter was transferred to the rescue division, supposedly for only six months, he found that he liked it. Preferred it, actually. Sixteen years have gone by, with Lt. Morse working one of the busiest EMS operations in the country — the Rescue 1 truck he rides responds to approximately 5000 calls every year. He has packed in more than enough experiences to fill the 155 pages of Rescuing Providence (Paladin Press, paperback, $22), as he takes us along with him on a 34-hour overtime tour of the city. Rescue 1 responds to a maternity call and to someone described as “an emotional woman with a knife, bleeding from the wrists,” to a couple of shooting victims and a belligerent drunk driver who plowed into a guard rail. And so on. Forty-two at the time recounted, Morse has been sobered up by the combined efforts of his wife, Cheryl, who is suffering from MS, and his daily mortality reminders on the street. He tells us about a 15-year-old kid with two bullets in him who looked up and declared, “I’m going to die.” Morse writes: “I don’t like lying to people who I know will be dead in minutes, because it doesn’t seem fair.” So he tells them to hang on but doesn’t tell them that they’re going to live. Many of the rescue calls are from people who have no emergency but simply want a free ride to the hospital, for a toothache or even a bad dream. And then there are the regulars like Darryl, a street drunk who calls 911 every day, sometimes twice, this day wearing clean clothes he stole from someone else in detox the night before. At one point Morse and his partner respond to a stabbing, and one of the friends of the victim says to him, “If he dies, you die,” as they make their way through the crowd. Such treatment has taken its toll on his partner Mike, who has told him that he’s putting in for reassignment to a ladder truck. Morse tells us that he has been thinking of quitting himself, since the work can be unbearable without such a compatible partner. Perhaps coincidentally, perhaps for the convenience of time compression, for his last shift this day he is assigned a young firefighter named Renato who enthuses over saving the life of an elderly woman who would have died of congestive heart failure without the EMTs. “Let me know if you ever need a partner,” he says to Morse. We’re glad for both of them. 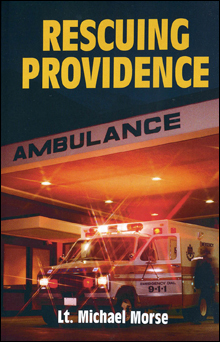 EMT’s, Paramedics, Firefighters, Doctors, Nurses and more than a few patients have approached me to tell me how much they enjoyed Rescuing Providence. It is humbling and gratifying knowing my story has helped so many people understand just what it is we do. Reading my book as part of any emergency medicine curriculum, or just a relevant and pleasant distraction from the demanding class work keeps the student’s adrenaline pumping, their minds alert and their hearts open. The best instructors teaching the finest programs often find it difficult to express what their students will face in the streets. Reading Rescuing Providence will give them an excellent taste of what’s to come. "This is one very well written look at the provision of EMS at the street level – sharp, gritty and realistic without being overly smug, smarmy or condescending. This is one medic's tale that is well worth tracking down for the read." "I believe this book is valuable for those who want to know what the job is like, for civilians, which will help them appreciate how these public servants give their all for others and for emergency room staff who only see them when they come in and when they leave. " "I've grown to appreciate the men and women working the rescue shift through the night. Many of them are listeners to my show. Reading "Rescuing Providence" though opened my eyes to the challenge, sacrifice and dedication these people take to the job. Mike Morse has crafted a thrilling book about the lives of those who come to the aid of strangers. It reads like a novel but every bit of it is true. " "Buy this book, and not just because it is drawn from the streets of Providence. Buy it because it gives us all the chance to go to the places and meet the people that we too quickly pass by. Buy it for the opportunity to know the incredible things that happen when a stranger from the Fire Department shows up to sew people up and calm people down and sometimes deal with the mean and dangerous side of the city." "Both surprisingly heroic and humane at the same time"
"Rescuing Providence, a new book by Providence firefighter Michael Morse, is an interesting look at the Providence they don’t put in the travel brochures, all told in a very readable, effective, descriptive style." "After listening to Michael Morse talk about his routine as a firefighter and emergency medical technician for the city of Providence, R.I., one has the urge to stop by the local firehouse or ambulance building and offer a word of thanks to all those for whom saving lives is just another day on the job." Dr. Sullivan provides copies of Rescuing Providence to his first year interns at Rhode Island Hospital, Southern New England’s only Level 1 Trauma center. Now, she wants more from author ‍Michael ‍Morse, more straight-from-the-streets prose that takes us to the crazy, cruel, funny places that emergency medical technicians (EMTs) see every day. “I have to get this one,” says Brenda, pointing to a copy of “Responding,” ‍Morse‍’‍s latest book, on the counter. The author is a customer. His books are sold at the Coffee Grinder. Later this month, ‍Morse will sign copies of “Responding” in this good place in the Governor Francis Shopping Center. So he took it out of the drawer and trimmed it into shape and made it the second book to tell of his time as an EMT, of those long hours of responding to accidents and assaults and the falling down misery of people on the streets of Providence. It has been more than four years since ‍Morse‍’‍s “Rescuing Providence” was published. The book covers one 34-hour shift around Easter weekend of 2004. It is based on notes ‍Morse wrote down after rescue calls. It is very good. It is a look at the city as few ever see it. “I loved the job so much as I was doing it, and I wanted to tell the story.” The job is one of those that a person either loves or finds some other way to make a living. It is exhausting, dangerous and incredibly rewarding. ‍Morse says he considers his two books anthropological looks at the people of Providence. “I’m invited into their lives,” he says. And he takes us along. “Responding” is a fine, skillfully paced second book that offers more fascinating pieces of life in the city, of the tragedy and the brutality and the small rituals that order the time between calls at the firehouse. There are the people the EMTs see at the worst of times: There is the woman, soon to graduate from college and get married, who falls from an escalator at Providence Place. She still has a pulse when ‍Morse and his partner get her to Rhode Island Hospital, but she doesn’t make it. ‍Morse treats another woman, repeatedly beaten by her boyfriend, for burns on her back. That’s where her boyfriend hit her with a hot pizza. There are people who fall down drunk and know the EMTs by name, and people who seem to regard the rescue wagons as their personal taxi service. I’m sitting in my ambulance posted in the North end of Hartford. Thankfully it has been a quiet morning so far and that has enabled me to finish Responding, Michael Morse’s great sequel to his first book Rescuing Providence. Michael is an excellent writer and one of the best EMS bloggers around. Responding chronicles a 38 hour shift, but it also has flashbacks to earlier calls, and at the end has many of the short stand alone stories that for me are the reason for reading Morse’s blog. What I like about this book, as well, as his first one, is that I found at several points, I was reminded of what I like most about EMS – the view of others’ lives and the quiet moments where you just stop and feel the whole universe around you, and sad or joyful, tragic or miraculous in that moment you feel that you are a witness to life and the human condition that is laid bare before you, and even if that moment hurts, you feel honored to be allowed to see and feel it and to be present. Three moments in particular in this book stand out for me, Morse on scene over time with a Cambodian woman, whose history he has learned, the brutal childhood and the spiral into alcohol, ending with him present to call the time on her now cold and stiff body; a scene where Morse visits his own mother in a nursing home and brushes her hair while she sleeps; and then on a transport to pick up a child with severe disabilities, and witness the love of his caregivers, as they brush the boy’s hair who they have cared for his whole life and say good bye. We as EMS are there in moments where we see life in its barest truth, and we also have the gift of touch that the single most powerful gesture we possess to affirm that we, as an individual and as a collective, are human. And by recording these moments, Morse brings our world to life and does the job of the writer that of bearing witness to our humanity. Before I became an EMT I read EMS books for accounts of the calls. Now the calls themselves are less interesting to me that the writer’s ability to chronicle what our lives in EMS are really like. While this book has war stories, more important for me is the view of what Morse’s life and world is like as an emergency responder and how he has come to his place in it. Responding is welcome addition to our growing body of EMS literature. I worked for a very high call volume, inner city Fire Department (now retired). This book is as close as you can get without actually being there. As someone who lived this life, I am sure that some of it would be lost on others who never experienced it, but again, if you are into this sort of thing, this book is a must read.